The balloon design was created for this church. My bride wanted something different. So with the wonderful ceiling lines I created the Enchanted Isle. I used 6" tulle, with an 18" latex helium filled to create this look. 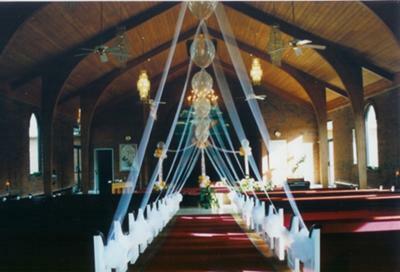 Tulle bows and draping with lights lite the isle for the bride. It was one of the most beautiful weddings I have done. You indeed created some magical design there. Thank you so much for sharing this beautiful wedding decoration photo with us.